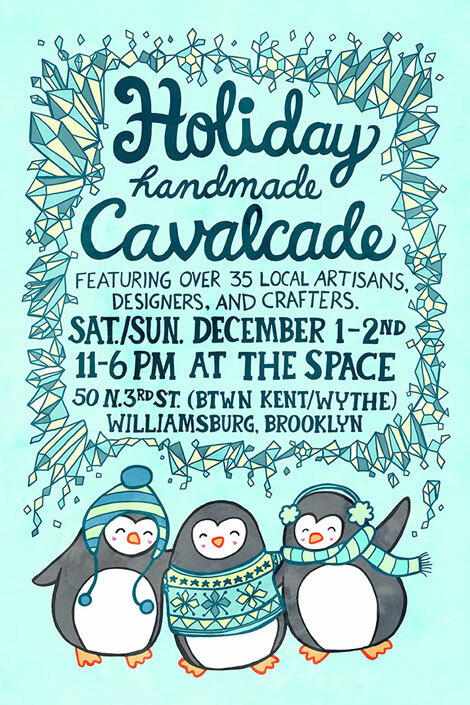 If you are in the NYC area this weekend, consider shopping the Holiday Handmade Cavalcade craft fair in Williamsburg, Brooklyn. The event will be held on Saturday and Sunday from 11 am – 6 pm at The Space and will feature handmade gifts from more than forty local Etsy NY craftspeople. There will be plenty of awesome gift ideas for everyone on your list, including one-of-a-kind handmade clothing, jewelry, accessories, paper goods, bath and body treasures, toys, and housewares. Swap-bot is a sponsor of the event and has contributed some fun stuff for the goodie bags which will be distributed to the first 100 shoppers each day. Get there early to make sure to secure your bag!